This record came out in early 2008 but finally landed in my hands. 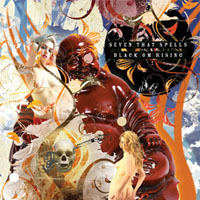 Seven that Spells are from Croatia and play a unique brand of instrumental psychedelic space rock. The band have been becoming more and more influenced by Acid Mothers Temple and have even joined forces with main AMT man, Kawabata Makoto on the follow up to this CD. The CD starts with a short 5½ minute psychedelic space rock track that leads into RA, which starts very repetitive before the spacey saxophone takes over and then the band kicks in. Interesting piece. Now we have the three part LO track which is pretty damn amazing stuff. It starts with some intense guitar that then leads into the next part where the whole band comes together and then Nico completely goes wild with the guitar and the track gets very intense with a cool groove and sax and guitar freakouts. Daktari is back to the space rock like the opening track and the band really flies and this features some really cool bass playing. The CD ends with a long spaced out piece. Great CD. This release comes on a special 2 sided disc, where one side is the record as a CD and the other is a DVD format with a two camera filmed concert from Croatia in 2006 and only tracks from this record. Actually, I think they play the whole record but in a different order and with improvisations. It may not play on all players. I could only get it to play in my DVD player and not at all in my CD players.